Get dinner on the table quickly with this easy and healthy, gluten-free recipe for one-pot curried chicken and rice with kale. This post contains affiliate links. One-pot meals are the best kind of dinner in the world, don’t you think? At least if you’re the cook (which I’m going to assume you are since you’re here to get this one-pot chicken recipe). I love cooking but the cleanup portion…not so much. This curried chicken and rice with kale cooks in one pot which means cleanup is minimal and the recipe is super simple and flavourful. 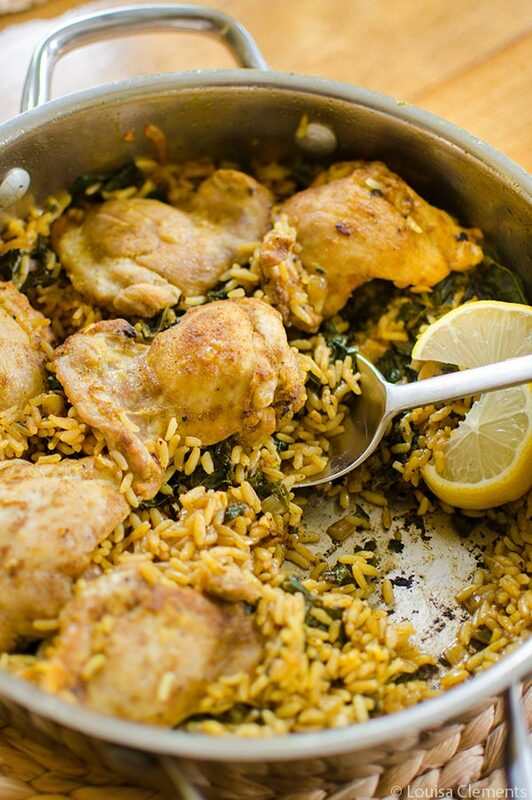 So voila, one-pot curried chicken and rice with kale is your new life-saving dinner recipe. There are certain ingredients that have a bad reputation, and I think rice is one of them. It can be pretty plain and boring if you don’t add additional flavours to it. I’m always experimenting with ways to change up rice because it’s one of those staple, pantry ingredients that I always have on hand. It seems to find its way into my lunch or dinner at least a couple of times a week whether it’s rice loaded with bell peppers, budget-friendly rice and beans or rice with a kick of cumin and cilantro. Can you use brown rice in place of white rice in this recipe? I definitely try to eat more brown rice than white rice, but because brown rice takes longer to cook, I opted to use long grain rice in this one-pot chicken recipe. The rice and chicken cook in the same amount of time. If you’re looking for a brown rice recipe, I love making brown rice mujaddara. The flavours of this dish come from curry powder and smoked paprika which are added to the rice and kale mixture and also sprinkled on top of the chicken thighs before they are seared off. For this recipe you’ll need a large saute pan (which is one of my must-have kitchen tools). Can you use skin-on, bone-in chicken thighs for this recipe? For this recipe you’ll want to use boneless, skinless chicken thighs. The first time I tested this, I used chicken thighs with the skin on because I love the crispy sear you can get on the skin. However, because of the added fat from the chicken skin, the rice and kale ended up being a little on the greasy side. Switching out the cut of chicken was such a simple fix to get this recipe just right. There aren’t many things in life that can be fixed with one simple change, are there? That’s part of what I love about cooking so much; if there is a problem with a recipe, 99.9% of the time there is a concrete solution. You can’t say the same for this messy and wonderful and complicated existence, can you. This one-pot curried chicken recipe is done in two parts. The first is searing the chicken, this will not only build flavour, but it will also make your dish more pleasing to the eye (we all know that chicken thighs aren’t exactly the most appetizing looking food). Next, you cook out your onions, garlic and spices, and finally the kale and rice get added with chicken broth. The chicken thighs are added back to finish off cooking. The final touch is a squeeze of lemon juice.The lemon juice is integral as the acidic element is a trick to brighten flavours (I use lime for this same reason in my ginger scallion soup recipe). Season chicken with 1/4 tsp salt, 1/2 tsp curry powder and pepper. Heat a large saute pan over medium-high. Add 1 tsp olive oil to pan, sear chicken for 3 minutes per side. Remove to a plate and reserve. Add remaining olive oil and onion, cook, stirring often, until browned, about 3 minutes. Add garlic, 1 tsp curry powder, smoked paprika and 1/4 tsp of salt. Cook for 30 seconds. Add kale and rice, cook for 1-2 minutes, stirring frequently until kale is slightly wilted. Pour in chicken broth, stirring to scrape up brown bits from bottom of the pan, bring to a boil (it should boil almost immediately). Return chicken to pan on top of rice and kale. Cover and cook for 20 minutes or until liquid has been absorbed and chicken and rice are done cooking. Sprinkle with lemon juice and serve. 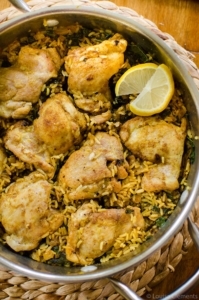 Let me know if you give this one-pot curried chicken and rice with kale a try. I was going to buy skinless and boneless chicken thighs yesterday since the regular ones was out of stock! I totally understand how skin on and bone in can make a meal a bit greasy. Next time I'll try the skinless ones out. Thanks for the tip! I wish I would've bought them now. Love your chicken recipe it looks and sounds delicious! This dish is a wonderful (and almost sneaky) way to introduce kale into a every-day type of meal; thanks so much for sharing! Thank you! The kale works perfectly here and it's such a great way to add extra veggies to your diet. Thank you Taylor! I love one-pot meals as well and rice is such a versatile grain but you have inspired me to create a one-pot quinoa dish sometime soon. I'm so glad you loved it, Rockie! It's one of my favourites too, love the added veggies – great idea! I love one pot recipes like this! Do you think it would work with wild rice instead of white rice? I make a few similar dishes, but always cook the wild rice separately. It would be so much easier (especially for clean up!) to do it all in one pot! Thanks! 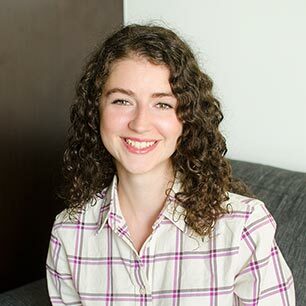 Hi Emily, thank you! The one thing with wild rice is that it takes longer to cook than regular rice, so if you do try with wild rice, I would recommend adding the chicken and kale back to the pot when there are 20 minutes left to cook the rice. Let me know how it goes! This is amazing! I would even go so far as to leave out the chicken and add more veggies next time. Perfect for both vegetarians and non-vegetarians. I made mine with chicken breasts cut into large pieces but next time I will make the pieces much smaller and just mix it all together to simmer. Will definitely use this...lots! Prepared this dish with bone in skin on thighs and breasts. After searing the chicken i removed some of the juice/fat from the pan before adding the onions,etc. it wasnt greasy at all. Really quite a delicious meal. Thanks. Is the 1050 calories for the whole 4 servings? Hi Nyisha, I'm not a dietician or nutritionist so I can't speak to the nutritional of calorie information of a dish. I have heard of people using My Fitness Pal to calculate calories. I hope that helps! Can I double the recipe and use a crock pot? Hi Jeanne, you can definitely double the recipe but I would not recommend making this in a crockpot. In my experience, rice does not cook well (it ends up being quite mushy). This sounds good. Can it be made with curry paste instead of powder? I have some yellow curry paste I need to use up in the next couple of months. Hi Roxton, thank you! Yes you could use curry paste instead of powder, I would use about 1 tablespoon of curry paste to replace the powder. Can you make this with curry paste instead of powder? Hi Jon, yes you could use curry paste instead of powder, I would use about 1 tablespoon of curry paste to replace the powder.